A number of conditions that may affect the middle ear and require surgery include inflammatory polyps, cancer, infection and foreign bodies. The inflammatory polyp is the most common surgical disease in cats. The cause of this condition is unknown but may be associated with chronic recurrent upper respiratory infections. 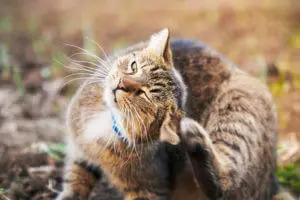 Feline leukemia virus (FeLV) or Feline immunodeficiency virus (FIV) infection may suppress the immune system, resulting in chronic infection that leads to polyp formation. Ear polyps are usually found in the younger cats, whereas malignant tumors are more common in older cats. A polyp starts growing in the middle ear cavity and with time ruptures the eardrum, and then continues to grow into the ear canal. Some inflammatory polyps will grow through the Eustachian tube (auditory tube) and appear as a mass in the back of the throat. The ear canal is a long tube that originates at the base of the earflap and extends to the eardrum to form the external ear. The middle ear is a hollow cavity (bulla) within the skull that is separated by the eardrum and contains three fine bones that transmit sound to the inner ear. The balance organ and a hearing organ that change sound into electrical signals are located in the inner ear. The sympathetic nerves are located within the middle ear. The auditory tube runs from the middle ear to the throat. Signs of middle ear disease include shaking of the head, scratching the ear, rubbing the ear, sensitivity when the ear is touched, foul odor from the ear, and bloody or yellow/green discharge in the ear canal. If the infection extends into the inner ear, your companion may keep the head in a tilted position, have continual shifting of the eyes, or walk in circles. Polyps that are in the throat may result in breathing difficulty. Inflammatory polyps can be removed by grasping the mass with a pair of forceps and gently pulling out until it is released from the tissues of the middle ear. This type of surgery can be done only if the polyp has grown up into the ear canal or is visible in the back of the throat. If the polyp cannot be removed by this simple method, a ventral bulla osteotomy is required to remove the mass from the middle ear. In addition, if the polyp has recurred following simple extraction, bulla osteotomy is recommended. During the ventral bulla osteotomy procedure, an incision is made on the under side of the neck, just behind the jawbone. The muscles are separated to expose the bulla. The bone of the floor of the bulla is removed to expose and remove the polyp. The polyp will recur 50% of the time when it is removed via manual extraction through the oral cavity or ear canal but will infrequently recur following bulla osteotomy.